‘Tis the Season! We wish you all the special joys of the holidays this month. As we conclude this year, and pause to celebrate our individual traditions with family and friends … please know that you are appreciated! Your participation in our programs this year, with your friendship and professional association, has enriched our lives and spurred our enthusiasm to continually expand and excel in supporting your professional learning. In this spirit of the season, we bring you primary sources of two predominant holiday celebrations in our nation this month. Reproduction of Painting by Arthur Syzk, c1950. 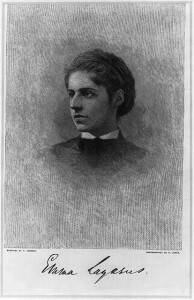 “In honor of Hanukkah, the Poetry and Literature Center would like to celebrate one of the most influential Jewish-American poets: Emma Lazarus. Most Americans know Emma Lazarus for the famous lines from her sonnet “The New Colossus” transcribed at the foot of the Statue of Liberty: “Give me your tired, your poor,/Your huddled masses yearning to breathe free,/ The wretched refuse of your teeming shore./ Send these, the homeless, tempest-tost to me,/ I lift my lamp beside the golden door!” Yet, Lazarus’ legacy spans much more than five fantastic lines of poetry. Lazarus was born in the New York in 1849 and descended from a line of Sephardic Jews who came to the United States via Portugal. She received a private education and from a young age became a master of languages—she was a fluent reader and translator of classic Greek and Latin, as well as modern French, German, and Italian. Throughout her life, Lazarus maintained a correspondence with some of the most influential writers of her time, including Ralph Waldo Emerson, William Morris, Robert Browning, and Henry James. Lazarus wrote her first collection of poetry and translation between the ages of fourteen and sixteen, and it was published commercially when she was only 18. She went on to publish five more books, including a verse-play. In 1882, she published Songs of a Semite—the first book of poems to explore Jewish-American identity published in the United States. Lazarus was an early advocate for the rights of the Jewish refugees and immigrants. She wrote several prose pieces dedicated to raise awareness of the plight of the Jewish people, and her famous lines from “The New Colossus” are in fact inspired by the influx of Jewish exiles that journeyed to the United States from Russia in the 1880s. Lazarus’ poetry truly gave a voice to a people who were voiceless. In our remembrance of Christmas traditions from our nation’s history, we would be remiss to not begin with the celebration of Christmas Eve on December 24th each year. In this year’s Today in History from the Library of Congress of December 24, 2014, (excerpt below) there is a delightful history of the fun children’s festivities surrounding the classic poem that describes the magical visit of Santa Claus! In hopes that St. Nicholas soon would be there…. ‘Tis December 24, the day before Christmas, and all through the land, families send excited children to bed with a reading of Clement Moore’s classic poem, “A Visit from St. Nicholas”. Moore is thought to have composed the tale, now popularly known as “The Night Before Christmas,” on December 24, 1822, while traveling home from Greenwich Village, where he had bought a turkey to fill the last of several baskets that his family was accustomed to donating to the poor during the holiday season. Perhaps inspired by the plump, bearded Dutchman who took him by sleigh on his errand through the snow-covered streets of New York City, Moore penned A Visit from St. Nicholas for the amusement of his six children, with whom he shared the poem that evening. His vision of St. Nicholas draws upon Dutch-American and Norwegian traditions of a magical, gift-giving figure who appears at Christmas time, and was likely influenced by descriptions of St. Nicholas appearing in several publications from recent years, including Washington Irving’s A History of New York (1809). Theodor Horydczak, photographer, ca. 1920-50. Portrait Photographs. Children with Tricycle and Wagon Next to Christmas Tree I, ca. 1920-50. Learn about the inventors of electric Christmas lights on the Library’s Everyday Mysteries Web site. The American Memory collections contain a panoply of holiday pleasures, from festive photographs of Christmas cards, to Christmas trees, decorated homes, choirs, nativities, and Santa Claus. To locate more images, search the American Memory photographic collections on Christmas. We welcome your questions to assist you with registration.